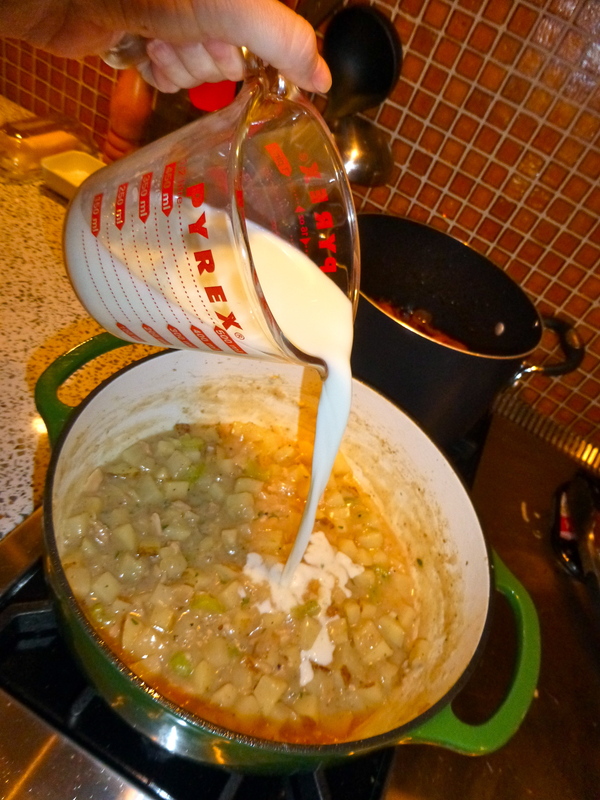 A New England love affair…with chowdahhh. I am smitten with New England. As a Southern Californian girl, I always had an idea in my mind about the Fabulous East Coast. I guess it came from the movies. It seemed so different than where I came from- and I was intrigued and enchanted by that. In college, a boyfriend took me to visit his old stomping grounds in Connecticut. The movies weren’t lying– it was a completely different feeling than the West Coast. The architecture of the homes, the weather, the kind of plants and trees, the people with various accents. Everything felt old, historical, like it had a story to tell– possibly many stories. We visited friends in Boston, brick everywhere, a statue of Paul Revere reminding me of the city’s past. I rode a subway and saw a rat. I saw the Manhattan skyline from New Jersey, the glorious, tall buildings kissing the sky. I spent a perfect day in New York City, on my birthday. After some shopping for clothes, I had my first sushi in Greenwich Village, followed by green tea ice cream. On a whim, we made a phone call and snagged the last two seats at the bar at the Blue Note and listened to Chick Corea play piano into the wee hours of morning. The day was as perfectly scripted as a Broadway play, and I was hooked. Since that first visit, I’ve been back East many times. There is an energy there that I can’t describe. I adore it. If you head further northeast, deeper into true New England, it’s a whole other world again. I’ve spent time in small towns in Vermont and New Hampshire. Thick trees line both sides of the interstate, blocking the view of what is beyond. Once you leave the highway, suddenly it’s all winding country roads and quaint farmhouses. If you’re lucky enough to be there in autumn, you’ll swear there’s nowhere more beautiful. There are things that you eat when you’re in this part of the world. Maple syrup. Cheddar cheese. 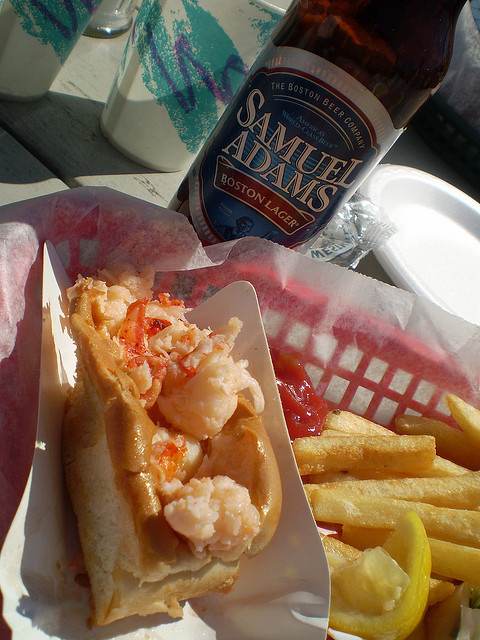 Lobster rolls. Dunkin Donuts coffee. Samuel Adams beer. I particularly loved Portland, Maine, the old fishing port and modern life colliding on cobble-y streets. 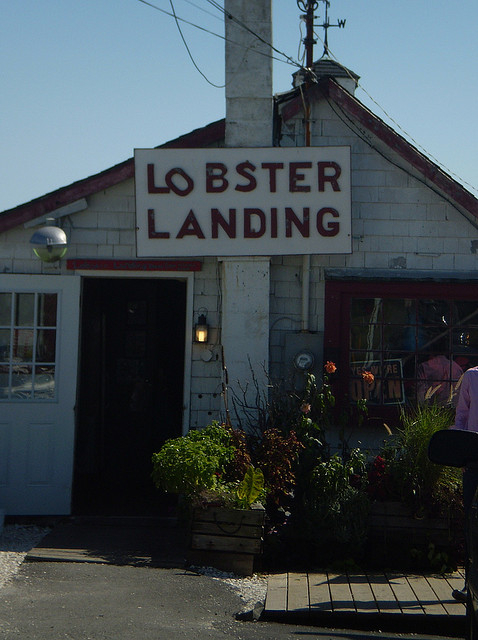 It was there that I had the best clam chowder of my life. Don’t mess with a New Englander when it comes to their chowdah. Every person you meet makes the very BEST chowder. Sometimes it’s got bacon, sometimes lots of potato. Sometimes it’s more brothy, and sometimes it’s thicker than New England fog. Whether it’s a cup from Legal Sea Foods at a Celtics game or a bowlful at a crusty old shack at the end of a dock, clam chowder is everywhere. And I could eat it every day. 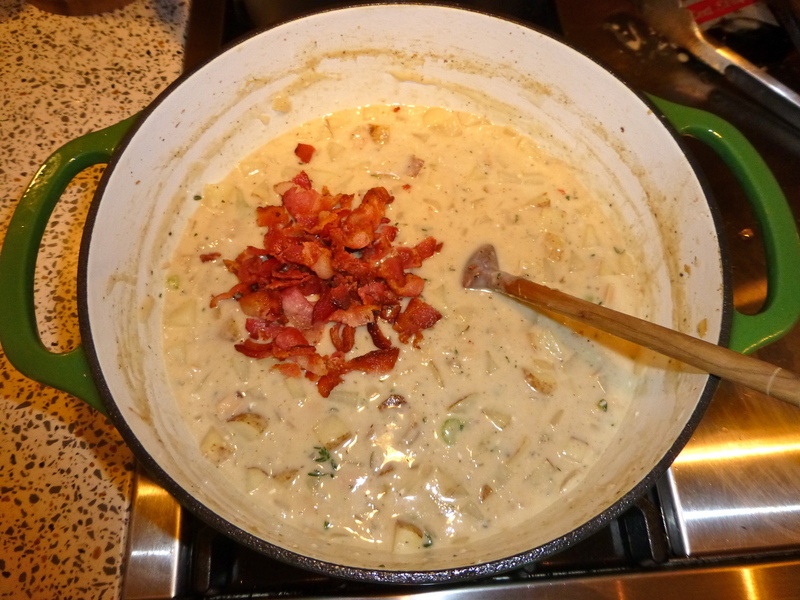 For me, a good chowder is on the thick side, nice and creamy, with potato chunks, lots of clams, and bits of bacon. 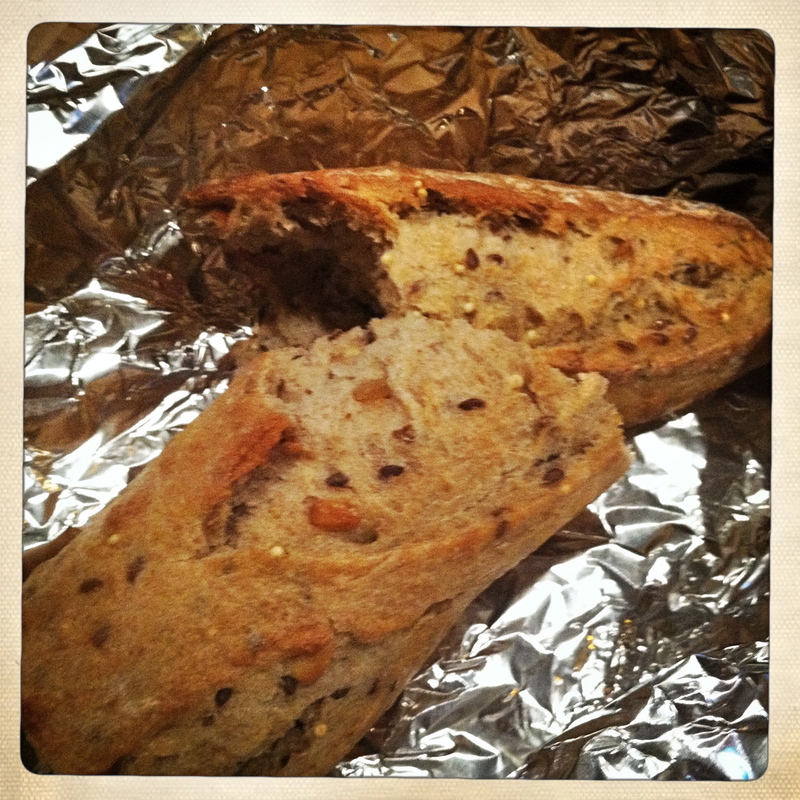 I like lots of cracked pepper on it and a warm roll to rip up and dunk in it. 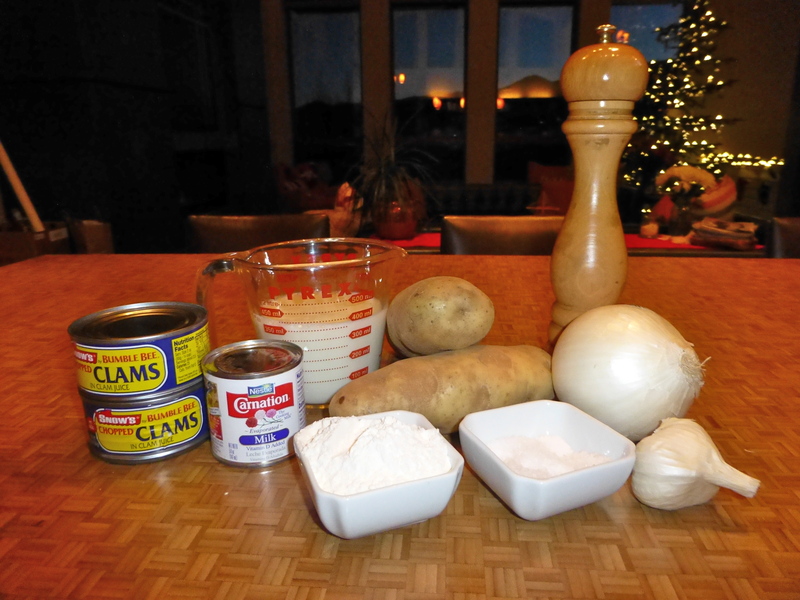 My mom gave me the recipe for her version of New England clam chowder years ago. I made it the other night, updating the recipe a tad, and ended up with a bowl of New England deliciousness. The ingredients are pretty basic. Even in landlocked Park City, Utah, you can always find canned clams. 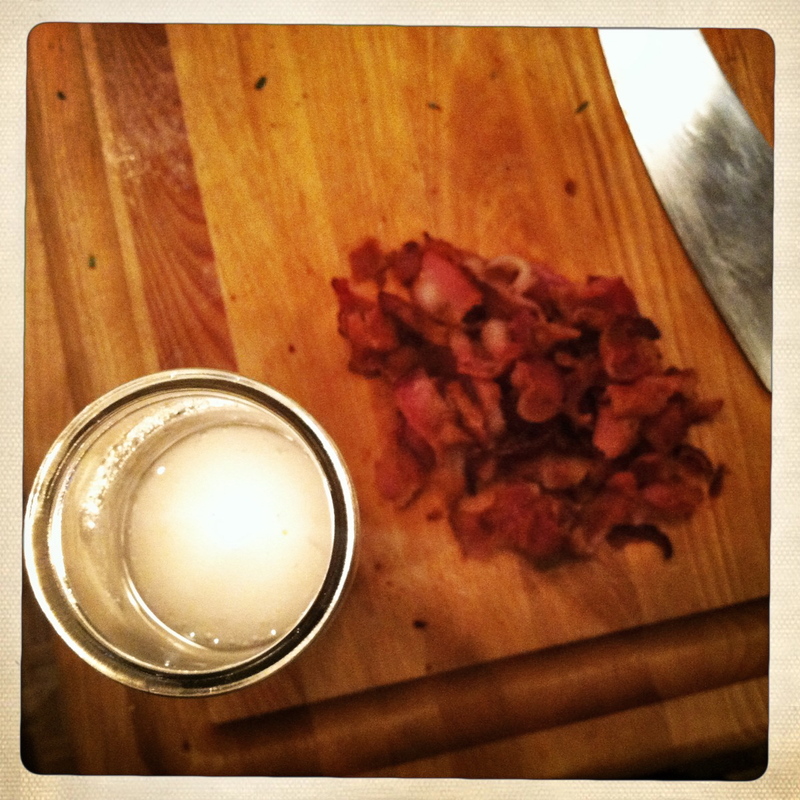 As you know, a lot of my favorite recipes start with BACON. We’re going to need those tasty drippings, so go ahead and get some going in a soup pot. 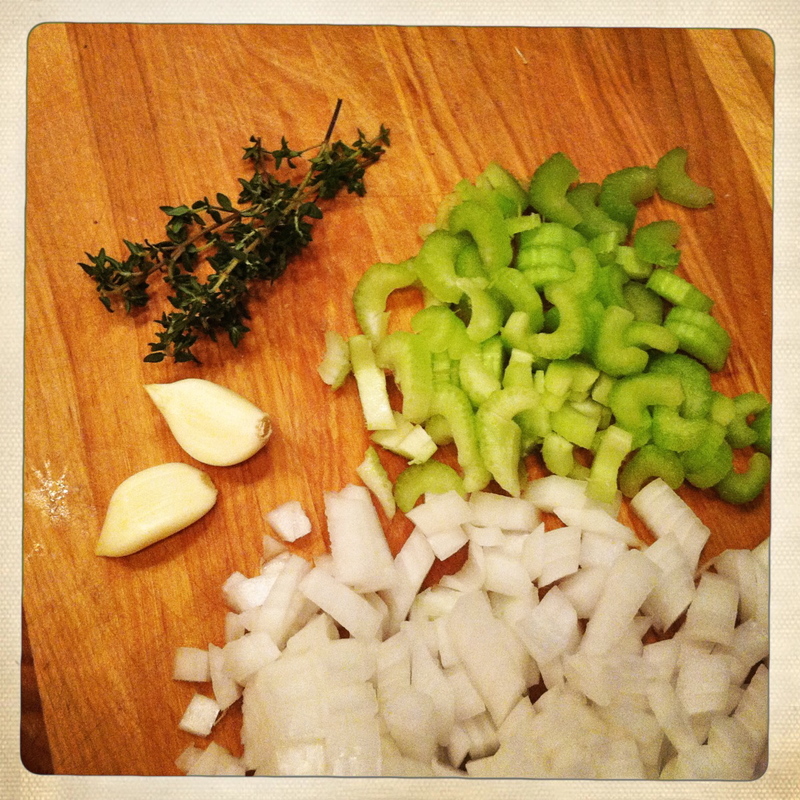 This will give you time to chop up an onion, some celery, a couple of cloves of garlic, and even some fresh thyme. 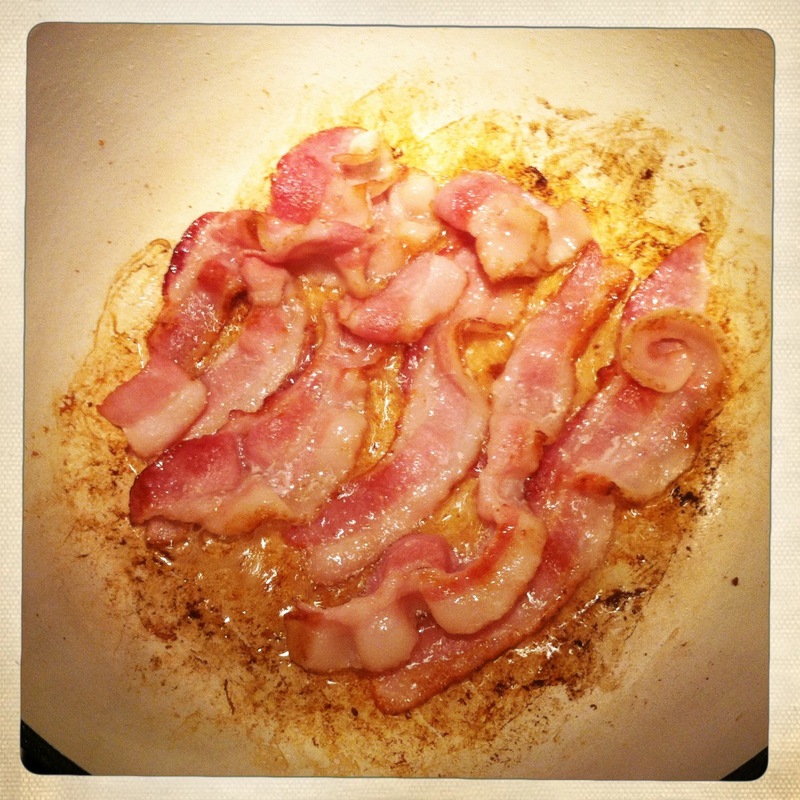 When the bacon is close to crisp, remove it from the pot, along with all but about 2-3 tablespoons of the drippings. 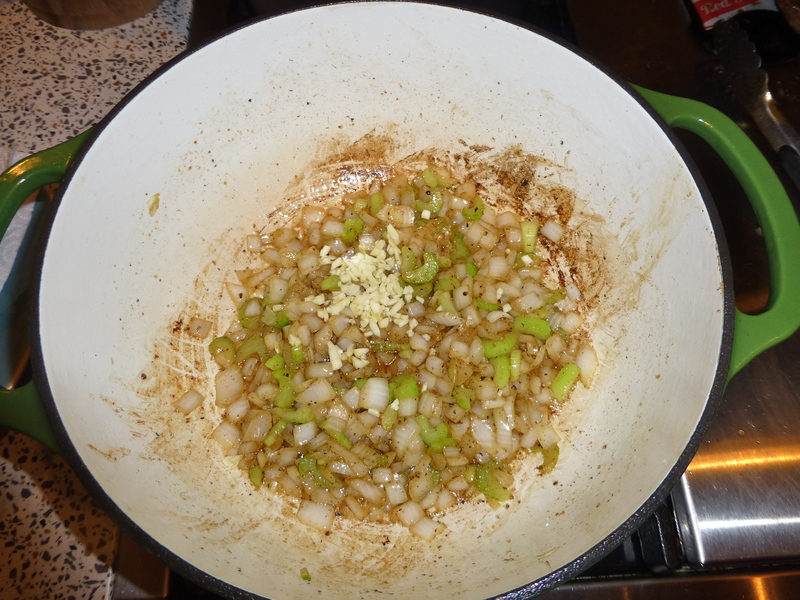 Toss in the onion and celery with a little bit of garlic salt, and let it do its thing for a bit. Add the chopped garlic and some cracked pepper. 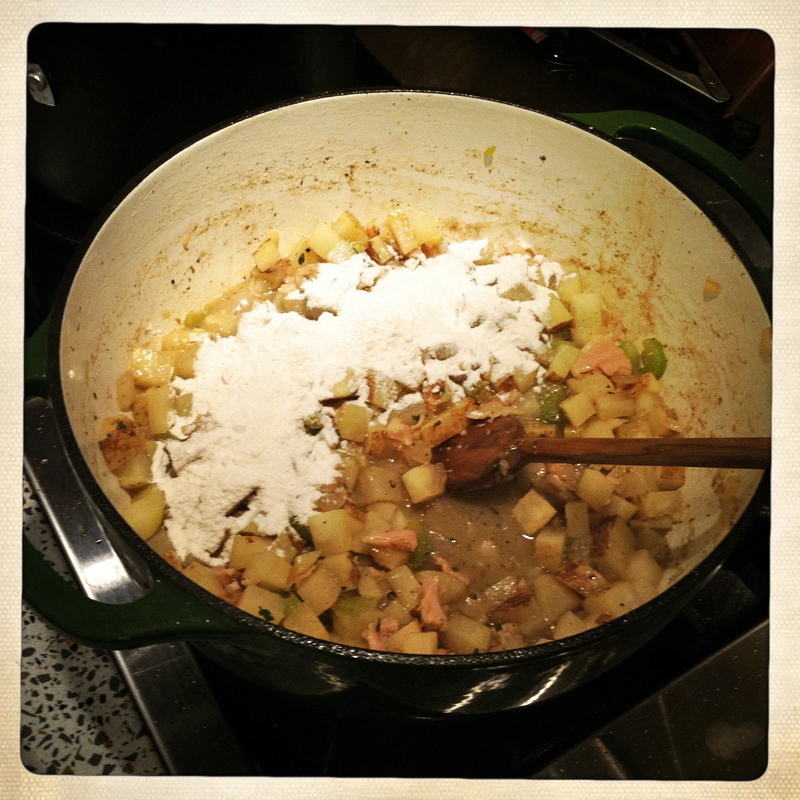 Mmmm…the kitchen will start to smell amazing! A good chowder needs TATERS. I picked up two large potatoes at the store, but it actually ended up being a bit too much. Two medium-sized ones would be better. Dice up the potato and remember that the smaller the cube, the faster they will cook! 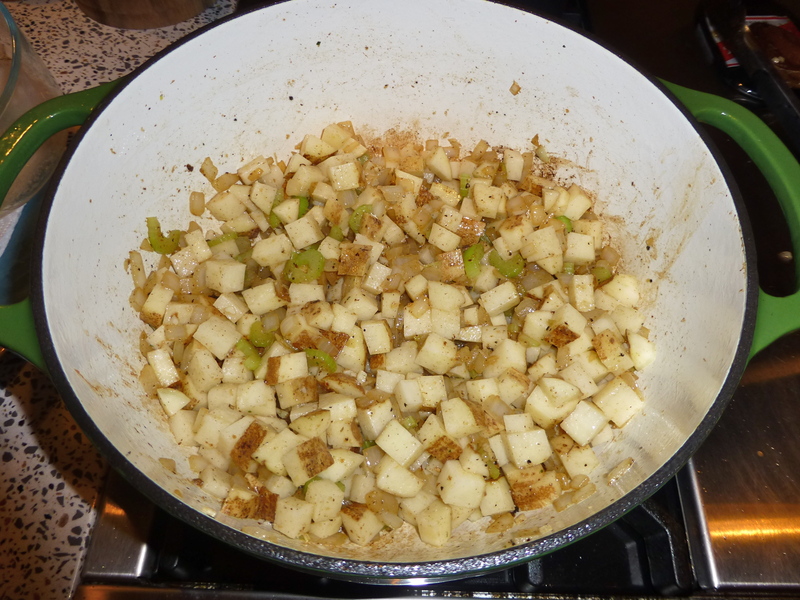 Add the potatoes to the pot and some fresh chopped thyme. After the potatoes cook “a while” (maybe ten minutes, stirring occasionally), soaking in some of that bacon goodness, add in your clams. Be sure to include the clam juice! I used two cans, but the final product needed more- use three. Add about a cup and a half of water, too, and give it a stir. Now, shake in a handful of flour. 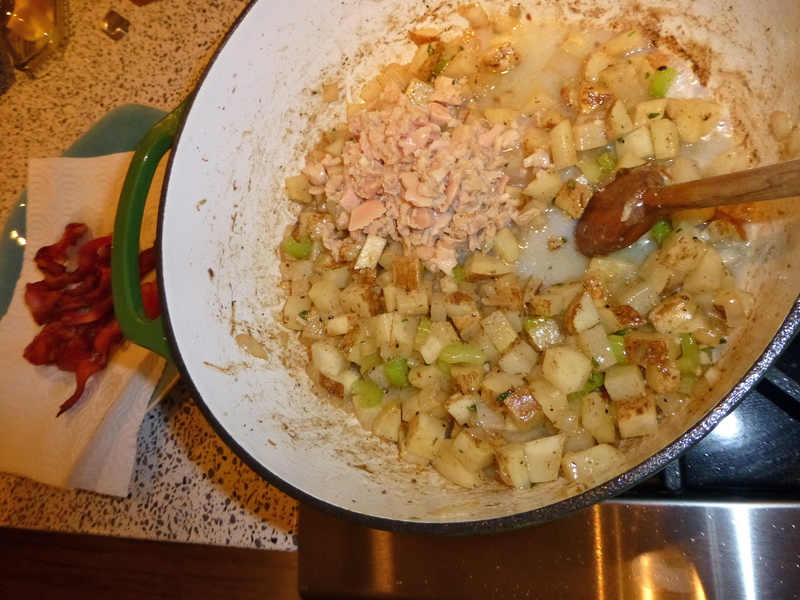 It will mix with the starch from the potatoes and help thicken up your chowder. Stir the veggies well for a few minutes, adding more salt and pepper, and let it simmer for 10-15 minutes until the potatoes are totally cooked, stirring every few minutes. Now’s a good time to chop up your bacon! 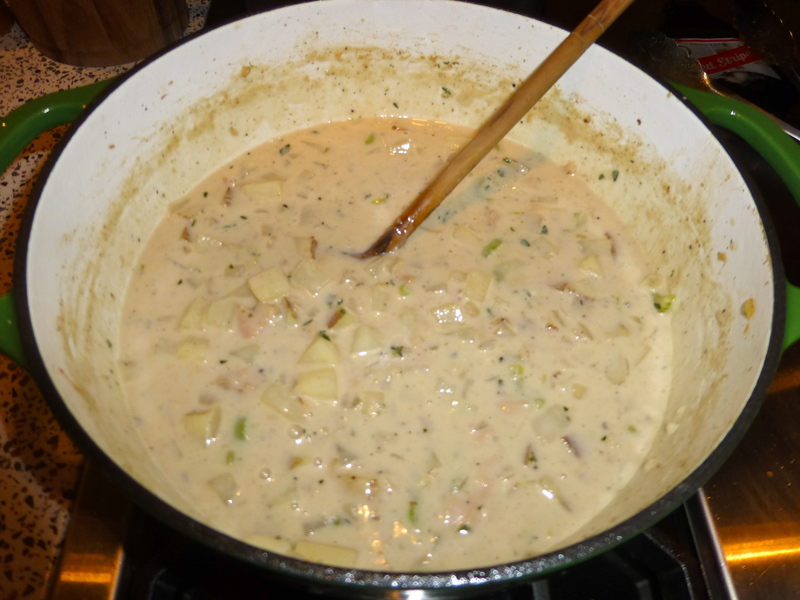 I like to keep the chunks kind of big– I just love a bite of chowder with clams and bacon as the stars! I also started warming up a crusty baguette and set the table. 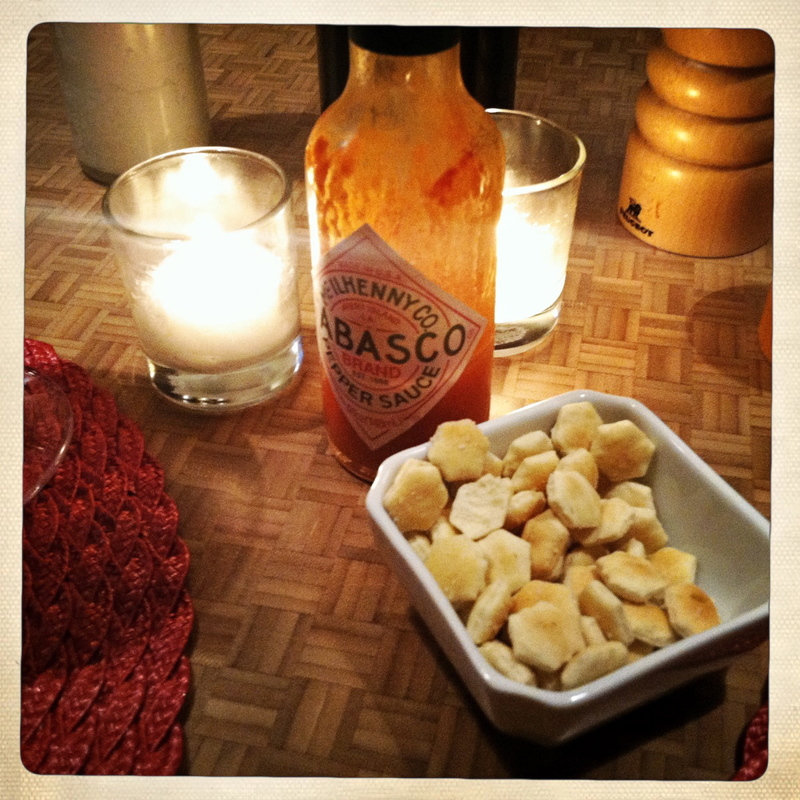 John helped me with some East Coast necessities: oyster crackers and Tabasco sauce. Test the taters for doneness- right in your mouth! 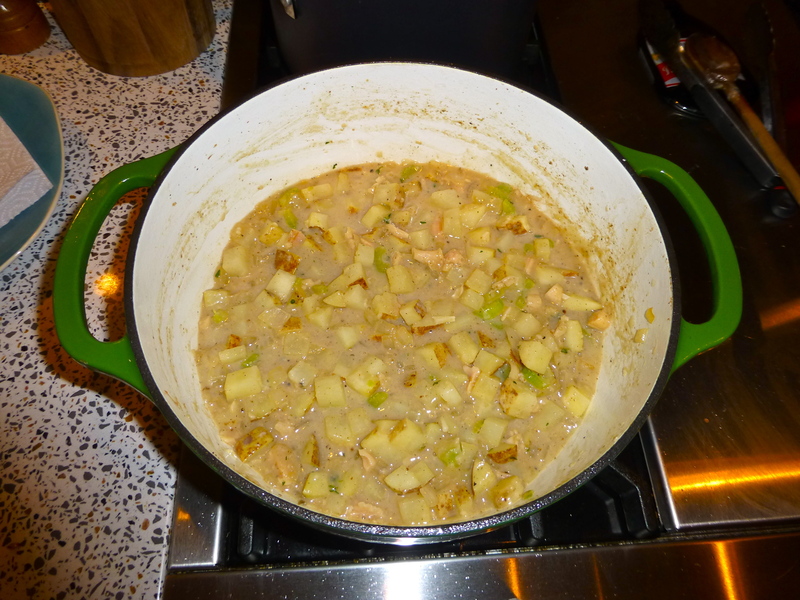 The veggies will have cooked down and started to thicken up a bit- that’s what you want. If it doesn’t taste OVER-seasoned at this point, you might want to add more. Because it’s time to add the milks, which will dilute the flavor a bit. I added a cup of milk and a small can of evaporated milk to the pot. As it simmers, the chowder will get thicker. Toss in some more fresh thyme and your chunks of bacon. 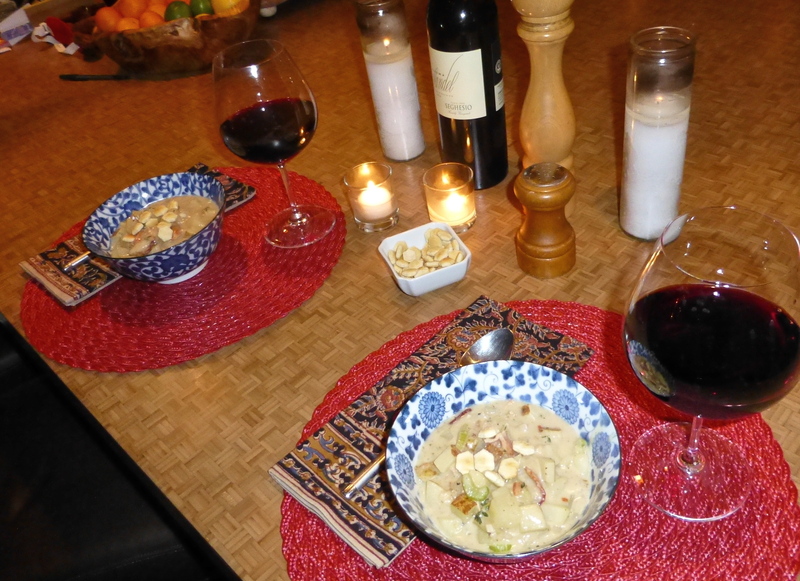 I hope you’re hungry- because it’s CHOWDAH TIME. John made his bowlful spicy with Tabasco. 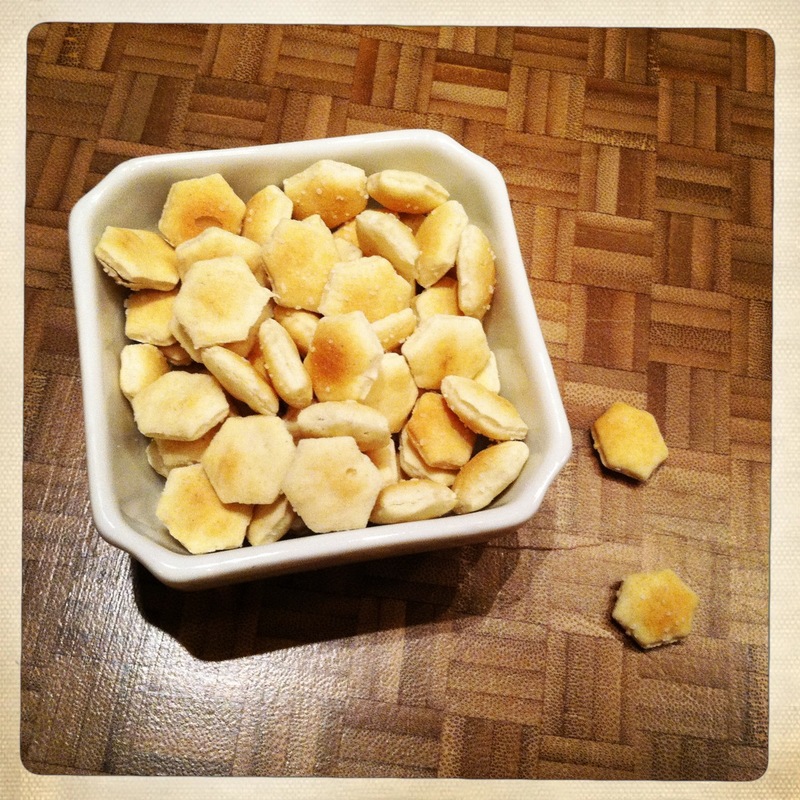 I think it’s delicious without it, but I did sprinkle a few oyster crackers on top, channeling my inner New Englander. 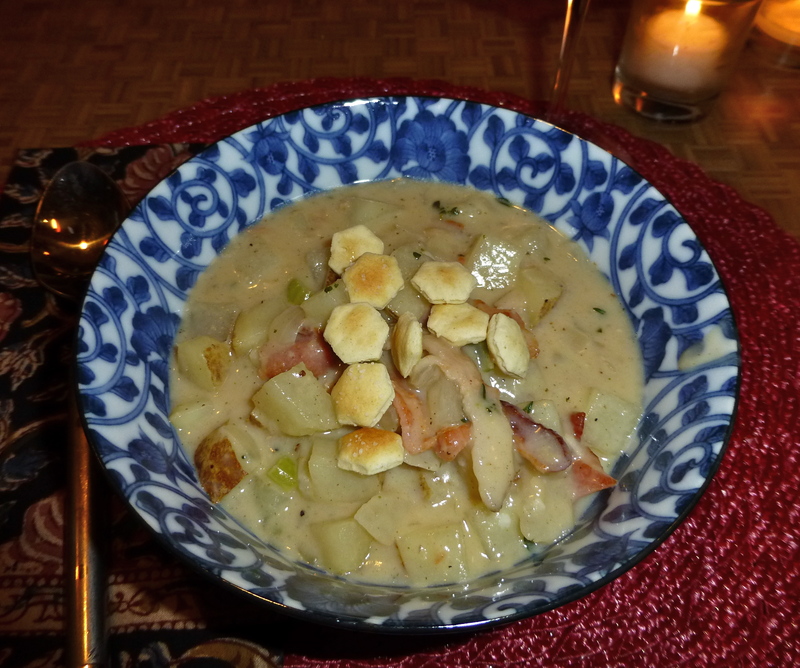 The chowder is perfectly creamy, with chunks of clam, potato, and bacon. The celery and the addition of the fresh thyme brings a subtle brightness to an otherwise pretty heavy soup. 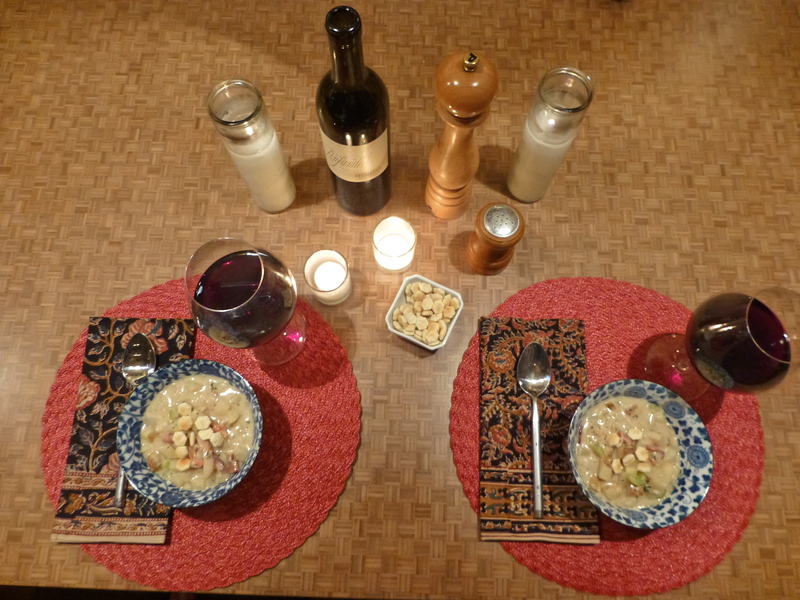 Chunks of bread alternated with our spoons as utensils, scooping chowder into happy mouths. Every bite prompted a satisfied, “Mmmmmm….” Scrumptious. With the snow falling outside, we might as well have been bellied up at a neighborhood sports bahhh in Maine, yelling loudly at the Pats game on TV and swilling a Sam Adams. I just love New England. 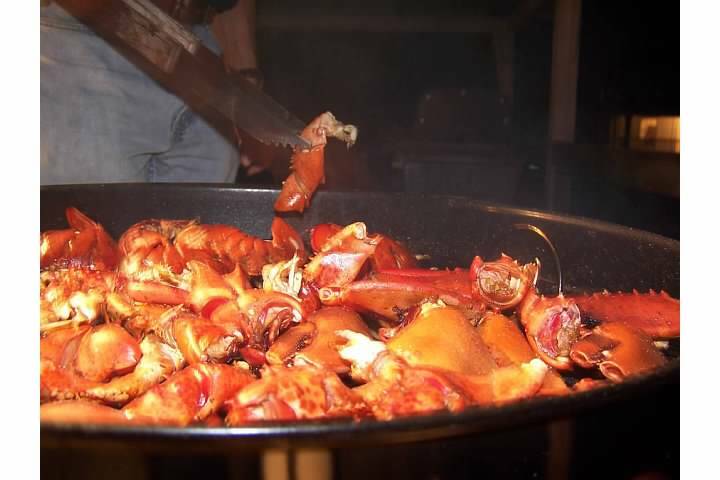 In a soup pot, cook bacon until almost crisp. Remove and set aside. Drain all but 2-3 tablespoons bacon drippings. 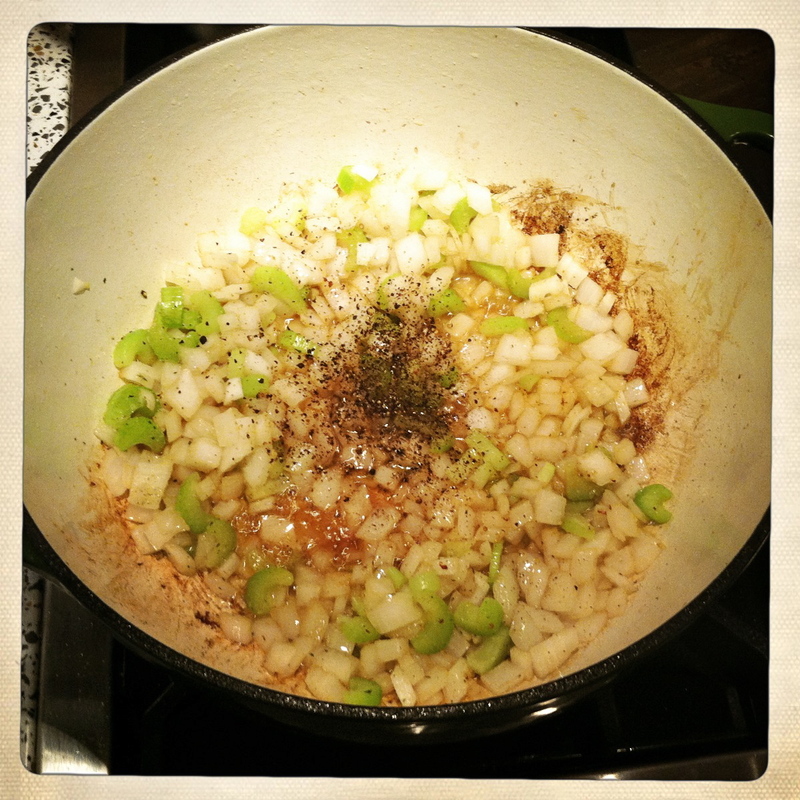 Add chopped onion and celery, salt and pepper. After a few minutes, add in the garlic. Cook for about 5 minutes. 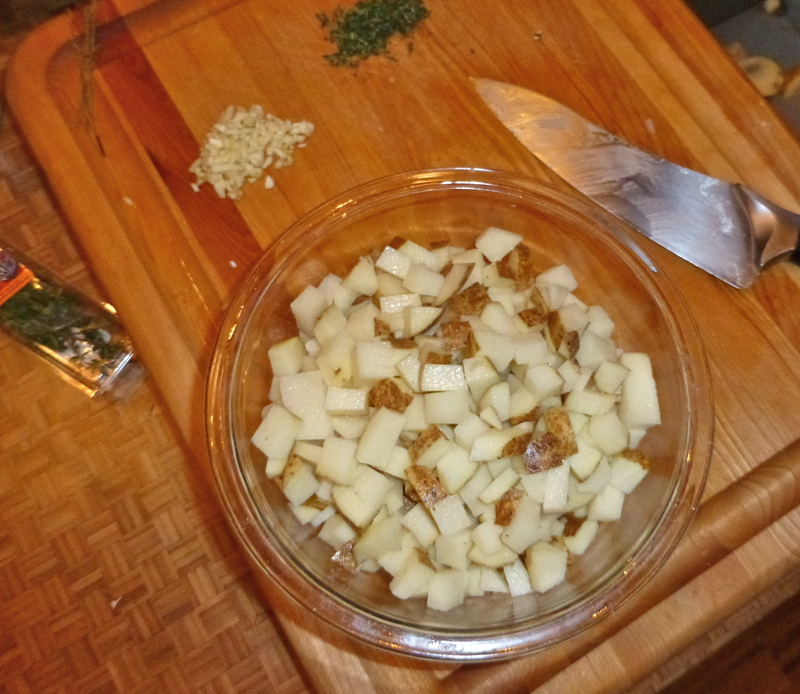 Add potatoes and half of the thyme. Cook for 10 minutes, stirring occasionally. 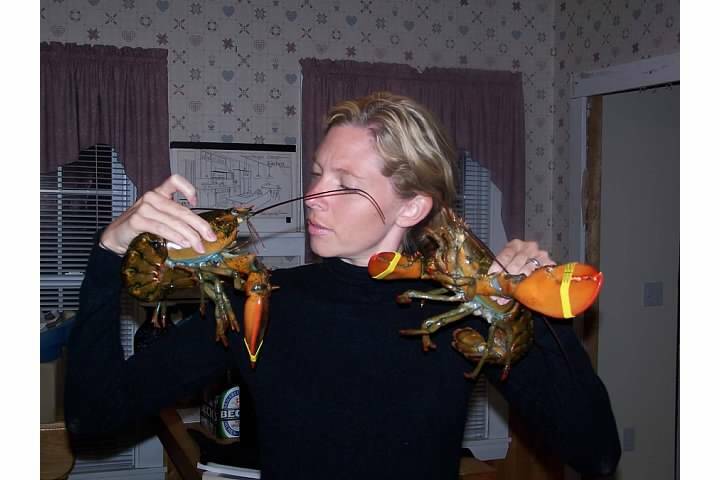 Add undrained clams and water. Shake in flour and stir. 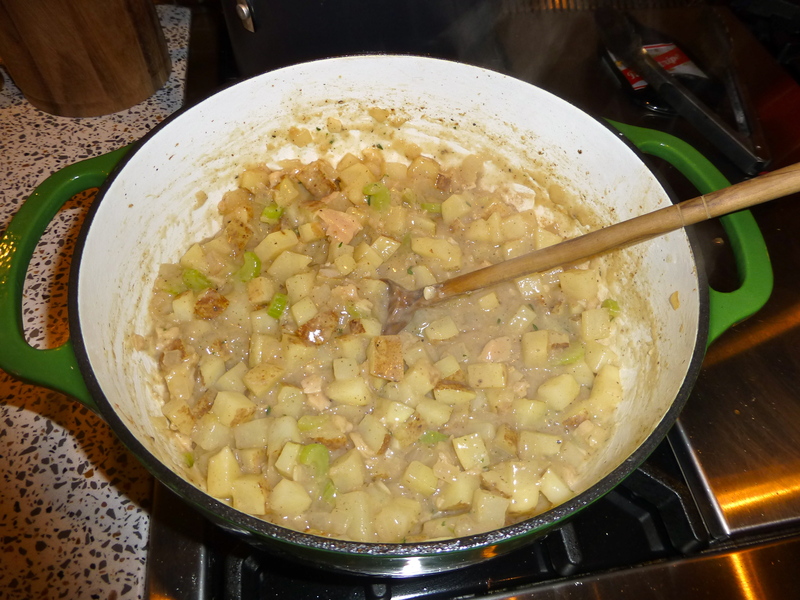 Cover and simmer for 10-15 minutes, until potatoes are tender. Add milks and stir. Add the rest of the thyme and chopped bacon. Let simmer and thicken, 10 minutes or more. Serve with oyster crackers. Replace spoon with bread if desired. YUM. Next postJesus vs. my husband. That looks so delicious. My husband is a big fan of clam chowder, but I never make it. I might have to give it a shot over the next couple of weeks! It’s really not hard and SO comforting! Yum! Amber, let me tell you something. This is the first year in my life I have not been able to make it back home for a New England Christmas with my family in New Hampshire. For just a second, while reading about winding lanes, brick, Sam Adams and a warm bowl of chowder – I was home. Thank you for sharing this post.